Good for the first timer or those on a budget. Includes rental rear entry boots and easy flex rental skis. Great for the first timer or those who have got the basics down and want something a little nicer than standard skis. Includes rental buckle boots providing more comfort and support and skis with the latest in rental ski technology. Skis that are designed to make skiing easier for the ladies. How? By making them lighter and by shifting more weight over the front of the ski = turn easier. Includes performance rental boots. Like going backwards? Or want a versatile all mountain ski you can hit the park with this is the range for you. Includes performance rental boots. Want a ski to help you progress faster - this is the range for you. Includes performance rental boot giving better control and a demo ski to suit your ability. The Ducks Guts. Latest high end skis to suit your skiing preference. Includes performance rental boots. 2 grades of snowboards - standard and high performance. Ride, Rome, K2, Salomon, Rossignol and more. The Ski Co. has a wide range of the latest equipment at very competitive prices. Good for the first timer or those on a budget. Includes rental boots and reverse or flat camber board = easier to use. For those who want a more versatile and responsive board. Includes rental boots and demo board to suit your ability. Pure, Cartel, Rip Curl, Terrain Life, NRG, Alternate, Aggression, Energy. We offer two ranges of excellent quality clothing in the latest styles and season colours: Standard - Fully waterproof, windproof and seamsealed. Performance - Fully waterproof, windproof, seamsealed with retail features from brands you know. Waterproof Breathable and Seam sealed rental clothing. Sizing from 00-14 (baby bags available). Chains for 2WD vehicles and mini buses are compulsory (4WD/AWD exempt but available). The Ski Co. has chains to suit most cars including low profile chains where clearance is a problem. Helmets are compusory for kids 14 and under taking lessons at Perisher. Thredbo recommends it. Ski and Snowboard Racks FREE WITH HIRE (Soft Racks and V-Racks). Great for the kids and the adults for a fun day in the snow. Great for the bigger kids and adults for a fun day in the snow can fit up to two adults. Great fun for the kids and adult for something different. Sizes to suit most cars and 4x4’s easy to fit. We will give you a demonstration and check the chains on your vehicle before you leave for the snow. A very thin chain designed for cars with little clearance. The Ski Co has a full range of accessories to add to your package- including gloves, beanies, goggles and sunglasses. The Ski Co. has very competitive prices on great packages to suit every standard. 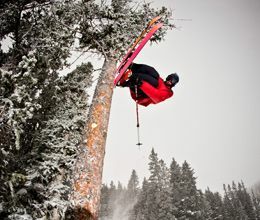 Adult Ski Packages include Skis, Poles, Boots, Pants and Parka. Kids Ski Packages include Skis, Poles, Boots, Pants and Parka. Adult Snowboard Packages include Snowboard, Boots, Pants and Parka. Kids Snowboard Packages include Snowboard, Boots, Pants and Parka. Standard - Skis, Stocks, Boots, Std Pants and Parka. Good for the first timer or those on a budget. Includes Standard Skis, Stocks, Boots plus Standard Pants and Parka....add a helmet to this package for just $8! Performance - Skis, Stocks, Boots, Std Pants and Parka. Great for the first timer or those who have got the basics down and want something a little nicer than standard. Includes Performance Skis, Stocks, Boots plus Standard Pants and Parka....add a helmet to this package for just $8! Standard - Board, Boots Std Pants and Parka. Good for the first timer or those on a budget. Includes Standard Board, Boots, Standard Pants and Parka....add a helmet to this package for just $8! High Performance - Board, Boots, Std Pants and Parka. For those who want a more versatile and responsive board. Includes High Performance Board, Boots, Standard Pants and Parka....add a helmet to this package for just $8! For a fun day of snow play. Includes Standard Pants, Parka and Walk Boots. Infant - Skis, Stocks, Boots, Pants and Parka. Includes Skis, Stocks, Boots, Pants and Parka....add a helmet to this package for just $6! Junior - Skis, Stocks, Boots, Pants and Parka. Children - Boards, Boots, Std Pants and Parka. Includes Board, Boots, Standard Pants and Parka....add a helmet to this package for just $6! We have a wide range of retail accessories for sale at competitive prices. Including pants, jackets, gloves, beanies/hats, goggles, helmets, socks, thermals, scarves, balaclavas, walk boots, sunglasses, sunscreen and lots more. Brands include: Pure, Giro, Smith, Scott, Sontimer, Swany, Reusch, XTM, Rojo, Alternate, Black Ice, Ocean Eyewear, Carve. Ideally located next to McDonalds Cooma in the Snowy Mountains NSW. Parking at the door or walk through from the McDonalds car park.